The Exo, soon-to-be Dublin’s tallest office building, has been awarded the highest rating for connectivity, achieving a ‘Wired Certified Platinum’ rating. Wired Certification examines the connectivity of office buildings, and considers criteria such as WiFi coverage, wayleave agreements, and cable pathways – the building’s digital backbone. Wired Certification ensures the building is future proofed for continued further development of the digital infrastructure, which is an increasingly important consideration for occupiers in the current market. Universal communication chamber enabling faster cabling installation. Backup generator for building and space for private occupier generator. 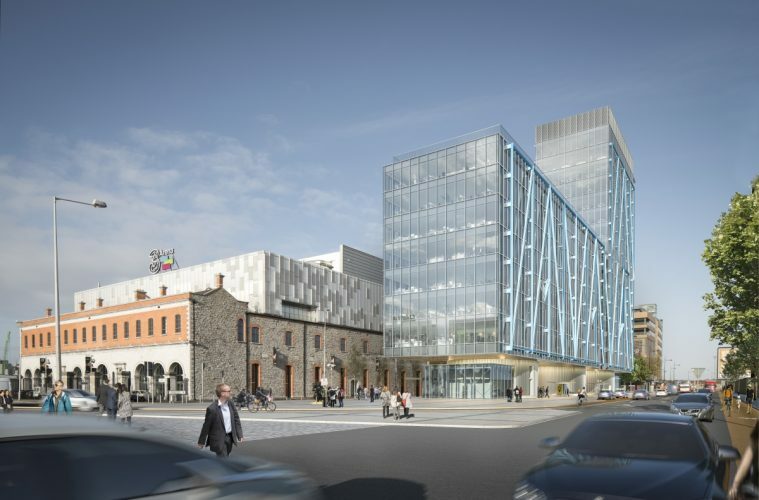 Situated at Point Square, beside the 3 Arena on Dublin’s north docks, the 73 metre office block will comprise 170,000 sq ft of Grade A office space, accommodating up to 2,000 office workers. Construction of the LEED Gold building – which commenced earlier this year – will create approximately 350 jobs at a cost of €70m. The building is due for completion in 2020. The Point Square (formerly Point Village) is one of only a handful of locations where taller buildings are permitted in Dublin. The Exo, which is designed by Irish architectural practice Shay Cleary Architects, responds to the design brief set out in the SDZ Planning Scheme and reflects the importance of this site within the wider Docklands. The local area has benefitted from Dublin’s economic recovery in recent years, with demand for commercial and retail space growing rapidly. In 2014, Yahoo moved its EMEA HQ to The Point Square which accommodates over 375 employees. The 3Arena, which attracts concert revellers, business travellers, and leisure tourists – has ensured The Gibson Hotel remains one of the most popular in the City, and the Odeon Cinema, which opened in 2012, continues to grow audience numbers. In addition, Starbucks, Eddie Rockets, Ruby’s Bar & Grill and Bunzl, have all either opened or are about to open new stores in The Point Square Shopping Centre. The buildings accessibility is unrivalled with the Luas stopping outside, and the Port Tunnel providing quick access to the M50 and a 15-minute trip to Dublin Airport – one of the quickest airport links in the world.